Saturday Update: The Rock says he and his doctor have decided not to re-attach tendons to his pelvis as part of rehabilitation following a reported injury during the WrestleMania main event on Sunday. "Injury update: Dr's & I elected not to reattach tendons to my pelvis. They'll just scar up. Now I prep to shoot HERCULES #TheDemiGOD," Rock tweeted Saturday. According to medical research, risks for tendon repair surgery include scar tissue formation that could prevent smooth movements, which would limit Rock's mobility for (a) movie roles and (b) future wrestling matches. Thursday Update: The Rock updated his rehab status Thursday morning. "My dr's said that starting back training w/ torn abdominals would be a b----. Just found out they were right;). We gotta push thru," Rock tweeted. Former WWE champion "The Rock" Dwayne Johnson tweeted more details on his reported abdominal tear injury mid-way through the WrestleMania main event against John Cena. 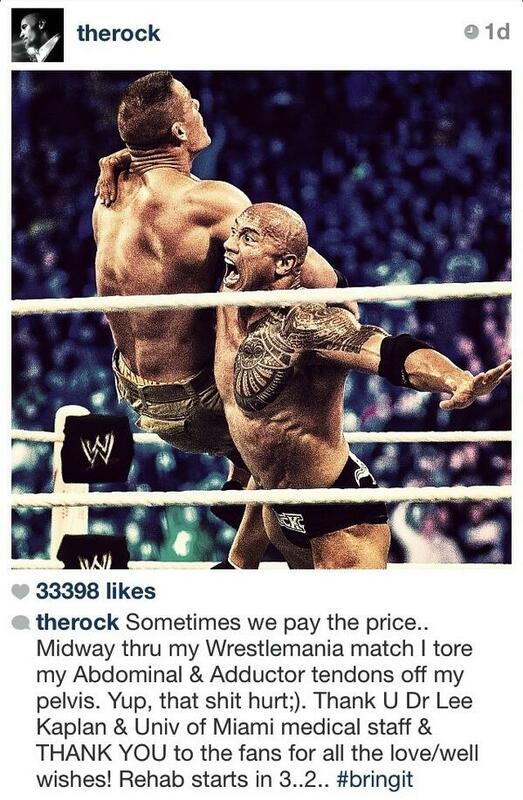 Rock tweeted a photo of him delivering Rock Bottom to Cena, with an accompanying tweet reading: "My 'Hmm.. I think I just tore tendons off my pelvis' face. Love you guys for all your support!!" 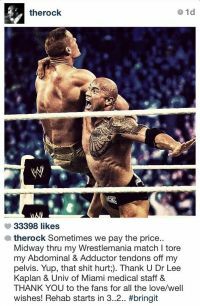 The caption of the photo indicates that Rock will have to undergo rehab after consulting with physicians at the University of Miami. Caption: "Sometimes we pay the price..Midway (through) my WrestleMania match, I tore my abdominal and adductor tendons off my pelvis. Yup, that s--- hurt. ;) Thank you Dr. Lee Kaplan and Univ. of Miami medical staff & THANK YOU to the fans for all the love/well wishes! Rehab starts in 3..2.. #bringit." Rock is scheduled to begin filming "Hercules" later this month, which is why studios hold their breath anytime Rock wrestles because of the risk for injury.